But your father’s grave can be a place to visit and reflect on good memories, to work toward coming to peace with family histories, and to lay flowers to honor him. Particularly on Father’s Day. Yes, families are not only remembering dad with flowers at the graveside on Father’s Day but even at the roadside memorials where he might have passed. Flowers, balloons, and candles can be used as witnessed by the tributes to Junior Seau, a father of four, at his oceanfront house. 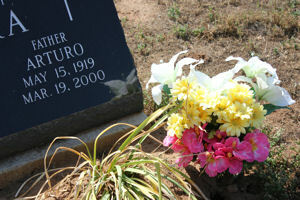 The El Cajon Cemetery on Dehesa, founded in 1902 by local families, has an endowed section and non-endowed section in their cemetery, and posts a sign of “no artificial flowers”--- instead allowing fresh flowers, plants, and other items on the graves. A hodge-podge of policies exist nationwide on roadside memorials, but California currently allows roadside memorials if alcohol was involved. Think in terms of days for the shelf life of roadside memorials. Max pointed out that a customer picks up flowers from his store on a regular basis for a roadside memorial on La Cresta Highway. 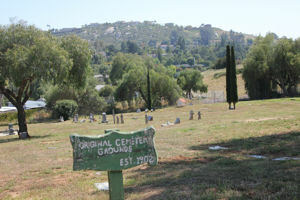 Check with the cemetery keepers in Alpine, Jamul, Campo, and even Singing Hills Memorial Park (to name a few) and all have varying policies about graveside flowers and if an urn is required. Historically sprigs of amaranth and ivy –symbols of immortality and brotherly love- have been used at funerals or on graves. But to personalize what your father might have wanted, think and remember what symbolized his life and or what he would have liked. Another stark, cold reality is theft of the flowers from the graves. This can happen, but what will remain is your knowledge that you did honor your father on Father’s Day. This you can carry in your heart always.